The Cricketers' Bible, The Wisden Cricketers' Almanack, is once again with us with this year's, 149th edition cover photograph showing five exultant England cricketers celebrating a dismissal on their way to becoming the No 1 cricketing nation. Lawrence Booth, who became the youngest editor of Wisden for seventy-two years, has written a very interesting Notes by the Editor section which includes the fears of Twenty20 taking over from Test cricket, India becoming the first winners of any World Cup on home soil, Lancashire's winning of the County Championship outright for the first time since 1934, India's cricketing obligations, the Woolf report into the ICC and the sentencing of the three Pakistani cricketers for spot-fixing. The ongoing debate about technology is also mentioned. Maybe once a taboo subject, depression, is the subject of a very interesting article which comes in two parts. Mike Brearley, former England captain and psychoanalyst, writes, as usual, very perceptively and this is followed up by recent sufferer, Michael Yardy. Kumar Sangakkara becomes the first cricketer to be one of the Five Cricketers of the Year but also The Leading Cricketer in the World in the same year. Praised for his batting efforts in not only all forms of the game but in many varying climatic conditions, Sangakkara was widely applauded for his MCC Cowdrey Lecture at Lord’s. The other Cricketers of the Year are Alastair Cook, Tim Bresnan, Glen Chapple and Alan Richardson. Given his dominant performances, Cook’s inclusion was presumably a fairly easy choice whilst Chapple was rewarded for his heroics at the age of 37 in securing the Championship for Lancashire. Bresnan proved that he is becoming a high class all-rounder but Richardson’s accolade will surely give county cricketers a boost as his efforts in helping Worcestershire avoid relegation have been recognised. Second only behind Monty Panesar in overs bowled throughout the season, Richardson took 73 Division One wickets during the season. It can be taken as read that the coverage of matches played worldwide during the season is second to none and the Records Section, compiled by Philip Bailey, and the Features of 2011 figures are, as always, impressively recorded. Other articles include Cricket and The Olympics, Women's Cricket Comes Of Age, Murali's retirement from International cricket and England's rise to No1. There is very good coverage of the World Cup and an article about the ICC written by the ever-perceptive Gideon Haigh. Other features include the Wisden Book of the Year which this year is awarded to Chris Waters for his biography of Fred Trueman; the photograph of the year is an impressive photograph of a game of cricket played at Chennai in India with dark clouds rolling in and the list at the end of the Almanack with an Index of Unusual Occurrences. If you fancy knowing how an international batsman, on 93 with one ball remaining, reached his hundred or how four run-outs came about in three balls pages 1166 and 844 will do the trick. 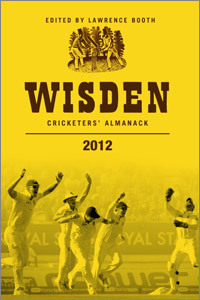 Wisden 2012 is once again a fascinating read and a must for all cricket lovers.